Ron Howard loves sharing little teases about the upcoming untitled Han Solo movie on social media. Ever since he took over the job from Phil Lord and Chris Miller in June, he has been sharing lots of fun little peaks behind the scenes at what they're working on. His latest update doesn't actually show us any of the set, but it does give us some insight into his process. 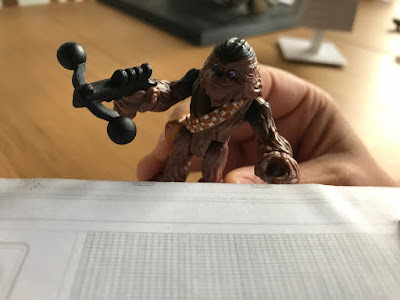 Howard tweeted a picture of a Chewbacca toy, with the caption, "action figures really help us figure out high octane action for #UntitledHanSoloMovie Yes folks, this is my day job"
He also confirmed that they make "explody" noises when planning out the action with their toys. Do you make explody sounds when they shoot at each other too? Admit it, if you were making a Star Wars movie, you'd do the same thing!